Standard - $24.99 Only 2 left! Racoon time? Yes, please! As we found out in Super Mario Bros. 3, acquiring a Super Leaf can do awesome, nature-bending things for a guy. And if you're an Italian Plumber, it can really take you to the next level! What could beat added abilities like a slow float and tail whip attack? And, of course, super dashing raccoon style! Of course, you don't have to make an appearance in the Mushroom Kingdom to wear a little bit of Mario's signature style. Just wear this Mario Raccoon Adult Hat to show others your Nintendo video game style! 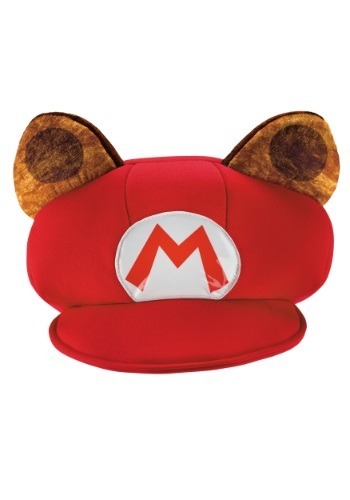 You can add this detailed hat to your signature Mario costume to add a new touch of power and become the fabled Raccoon Mario that's ready to save the day. Or you could just wear it for fun, to show off your serious Nintendo fandom! Everyone in the know is going to be able to tell that you're ready to save the day when they see the perky plush ears poking from your M hat. With polyurethane foam and soft polyester fabric, this costume hat for adults will bring the video game action to life!